A day of mixed weather and a depleted team would normally make for a short entry in our watermill blog, but we managed to make something of the day. 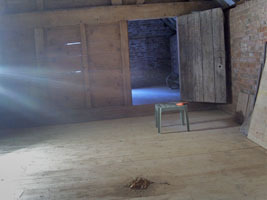 Jonathon and Kim laid the last few planks to complete the hay-loft flooring. The only tricky bit was cutting the last board to width along its length, a task which lead to a fair amount of discussion. A portable circular saw, recently donated to the mill, proved to be an excellent tool for the job and the last plank was nailed in place. 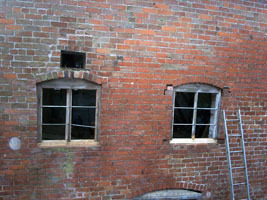 John dodged the weather and finished pointing up around the window we re-fitted last week. With help from Headley, Kim and Richard he also got the second repaired window back into position but not yet bricked in place. The new timber is very obvious at the bottom of both windows but should fade with time. The insides of the frames were limewashed but we are not sure about the outsides. Headley spent most of the day re-arranging the west end of the workshop, trying to make space for the chaff-cutter to be re-assembled. Once this machine is back together it will be difficult to move far so we want to build it where it is going to stay. Derek managed to light a bonfire in spite of the rain showers but it never really got going. Still, the continued efforts are getting the undergrowth on both sides of the mill under control. Towards the end of the day we had a visit from Dr Paul Stamper, the Heritage Protection Adviser for English Heritage. Richard and Headley gave him a conducted tour of the watermill that he found very interesting, taking lots of pictures. His task is to guide English Heritage's advice to the Secretary of State about whether the mill should be a listed building in its own right. He seemed to think the watermill was worthy of listing but probably not important enough to justify a star rating. It will be a while yet before we know the outcome of his visit but as soon as we know it will be reported in this Watermill Blog.